Karen, of North Carolina, is one of the reasons we started featuring remodeled homes here at Mobile Home Living. Not only do we love to share remodeling ideas but we also love to give a pat on the back to a homeowner who deserves it. Karen’s journey to restore her 1986 single wide is definitely one of those times. Karen and her husband moved to NC in 2012 from upstate NY. 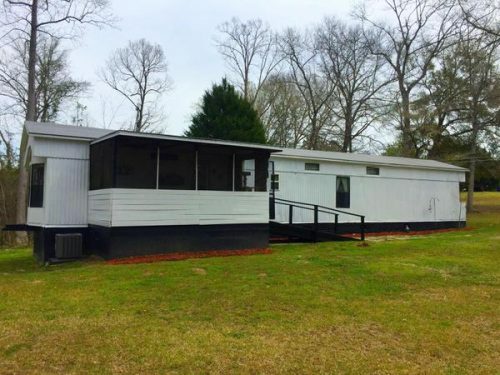 She says,”the mobile home was in rough shape, it had red linoleum and just needed an update!” They started the process of remodeling, with Karen taking on the bulk of the load because she says he just wasn’t very “mechanical.” But in January 2017 everything came to a standstill when her husband passed away. While he was sick the home had been put on the back burner as Karen worked and cared for her husband. 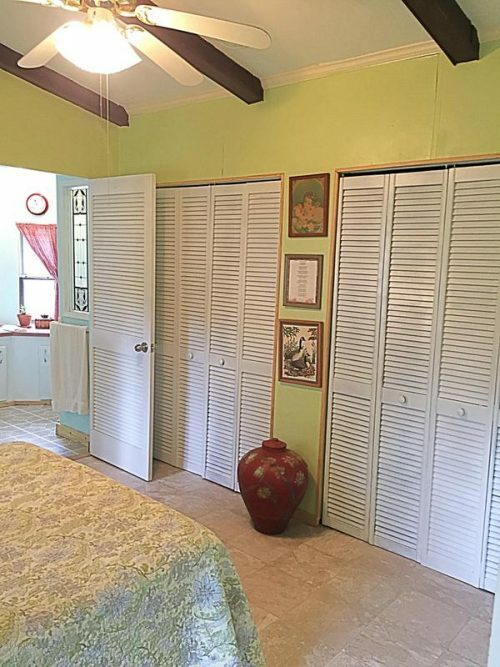 Related: A Cute 1986 Palm Harbor Single Wide Makeover. Love the updated fireplace look. Needing a break after he passed, Karen decided to roll up her sleeves and get to work. She spent the next few months working to restore her 1986 single wide. 12 hours a day, every day, were spent replacing all the subfloors, the water heater, the porch roof, all new sinks, updating the plumbing, painting the interior and exterior and screening in the porch. ALL BY HERSELF! That right there is pretty amazing if we do say so ourselves. bi-fold doors make the most of the space. Plenty of light in this bedroom. 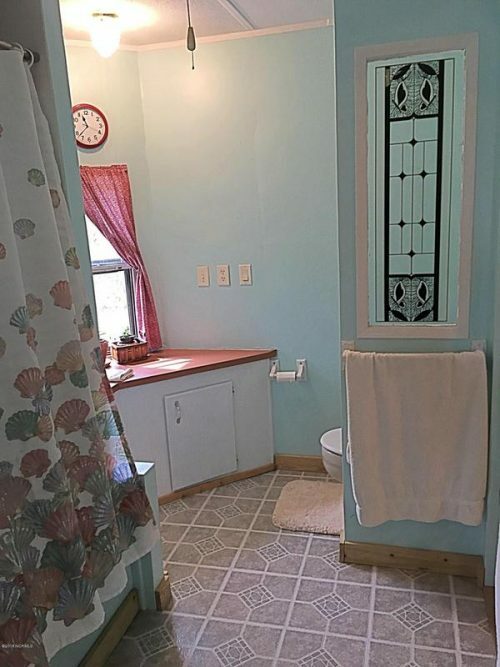 Light colors make the bathroom appear larger. 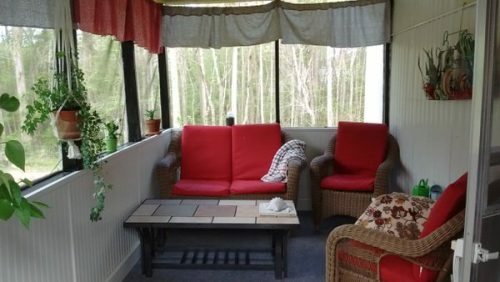 Screened in porch turned out great. Total Cost of the project? What tools and materials did you use? A circular saw, jigsaw, reciprocating saw, table saw, plywood, 4×8 sheets of white paneling (which I cut to be wainscoting), shiplap boards, linoleum and tile, and tons of caulk! When I put the water heater in and hooked it up, and had HOT WATER! The porch, it turned out exactly like I envisioned it. We love the porch too! The advice you would give someone thinking of buying a mobile home? If it’s not what you initially envision, do some remodeling. It doesn’t take lots of money. Paint is always a great way to start. Related: How to Paint Vinyl Walls in Mobile Homes. Loading, unloading and carrying all that plywood and paneling by myself. I did use a wheeled garden stool to help move some of it (had to get creative). Any final tips or tricks to share with our readers? There are ways to cut a full sheet of plywood by yourself. I figured out to use another table to lay the piece of plywood on while I moved it through the table saw. Karen tells us that unfortunately, she has decided to sell her 1986 single wide so that she can move closer to her family. 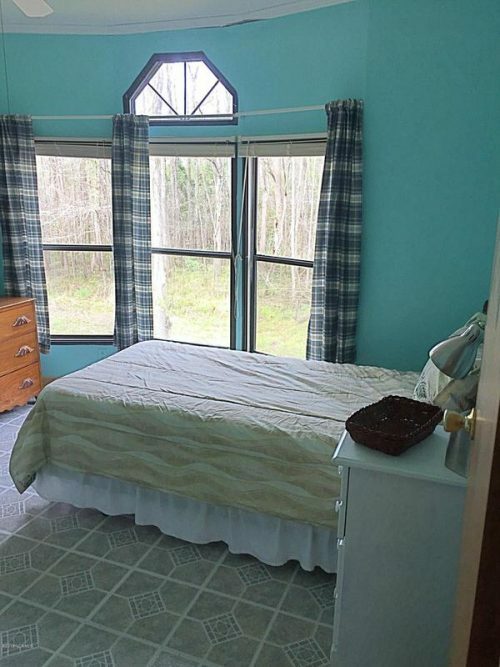 You can find the listing here at Century 21 Sweyer & Associates. 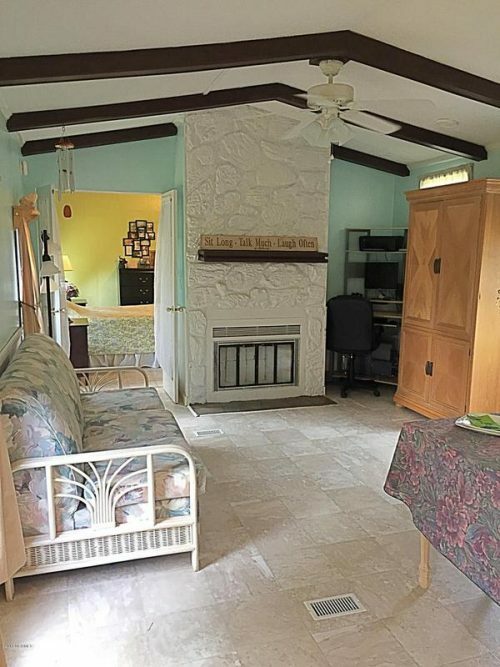 The listing describes it as a 2 bedroom/2 bath for $67,000 (you can see more images there too). This kind of story is precisely the kind of inspiration we want to share with our readers. 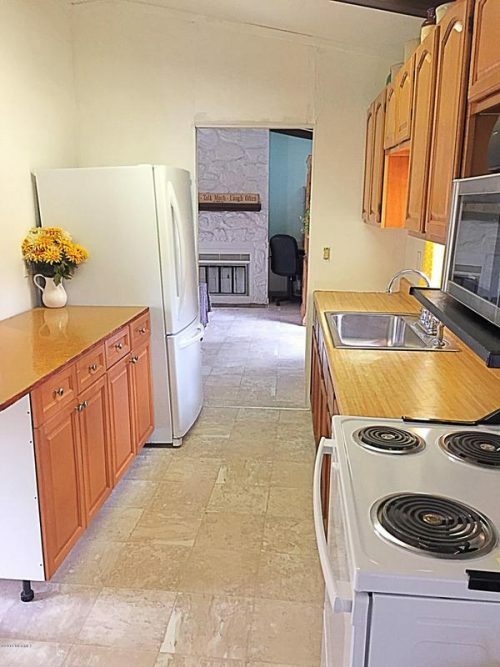 Mobile homes are full of potential. You just have to find a place and start. Have a remodeling story you would like to share? We want to hear from you. Visit our get featured page to learn more. Also encouraging to see simple vinyl flooring used. Laminate flooring is over used and overrated. I have despised that used in my shack since I bought the place. Low grade, poor installation. It irritates me every time I see it. Mainly from the rotten install, but it shows every piece of lint, any scrap of paper or detritus from my bird and her seed cup. I dream of something like Karen has used. : clean, interesting and crisp vinyl that complements her design choices. Thanks once again for a great feature.